A comprehensive training program tailored to suit you. FACT:It is the employer’s responsibility to ensure that all employees are given adequate training for the task at hand. We can facilitate IPAF Operator training at our Coventry depot, or if required on site as well. All operatives will receive a certificate on successful completion of the course and a PAL (Powered Access License) which is valid for five years and is recognised by the Health and Safety Executive. If you are looking for IPAF Training in Coventry & Warwickshire contact our office today and speak with our friendly team who will be pleased to discuss your individual requirements. Please do not be fooled by cheap copy courses as these are often not accepted on construction sites, or recognised by the HSE. International Powered Access Federation Courses. Operator Training on Self-Propelled Scissor Lifts & Boom Lifts (categories 3a &3b). Operator Training on Vehicle-Mounted & Trailer Mounted Boom Lifts (category 1b). Safety Harness use and inspection (category H). PAL Plus courses for all of the above categories to the highest qualification available (as required for certain main contractors). 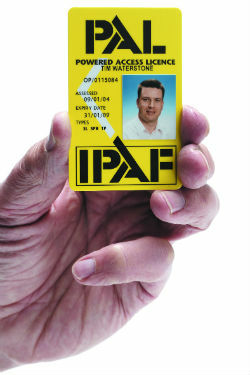 IPAF (International Powered Access Federation).